Selling agent for PC-12, TBM, Meridian, and Jetprop aircraft!Special pricing on finders fee for specific PC-12, TBM, Meridian, and Jetprop aircraft. Call Ron Cox at (772) 538-1965 or email info@roncoxaviation.com for details. CUSTOMER SERVICEYou may Contact RCAS directly by phone 772 538.1965, or for additional information, feel free send us an e-mail to info@roncoxaviation.com. ACCESS eTRAINING Already have an Account? Click here to login. Online Courses Include all facets related to aircraft systems and procedures modules. Learn how to fly properly using a multimedia interactive experince. Chapter Quizzes and a Final Test is included. Achieve your Ground School requirements and you will receive a course completion certificate. Meets many aviation underwriter’s approval for Refresher Training. 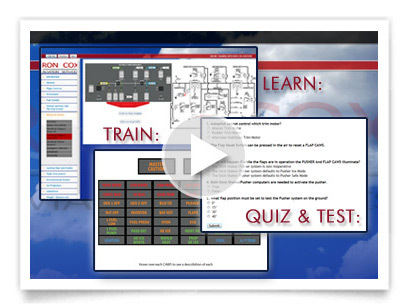 The e-Training demonstration provides a quick glance and overview of a Ron Cox Aviation eTraining course. 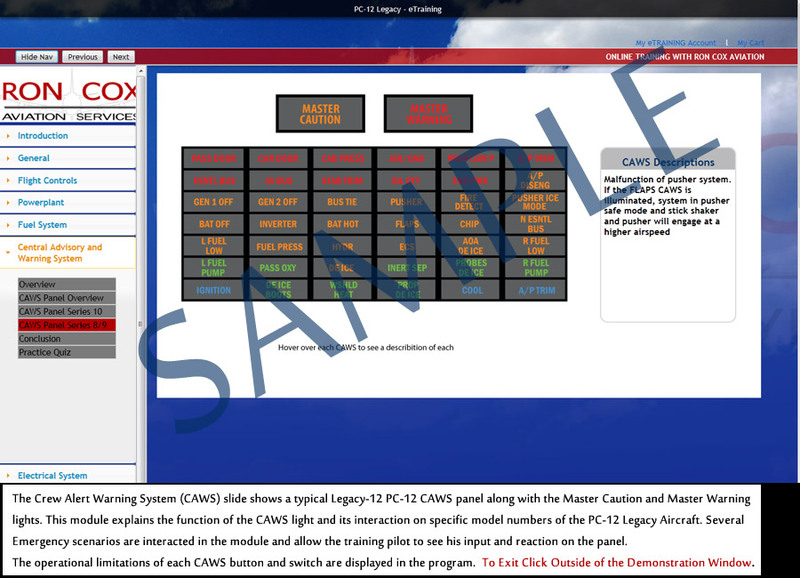 This demonstration provides a sample of interactive diagrams, aircraft specific content, practice quizzes, visual representations, photography, video, and operational tips. If you have any questions prior to enrolling by registering online, feel free to call (772) 538-1965 and speak with a Ron Cox Aviation Service representative, you may also ask us any questions via the "contact us" section. 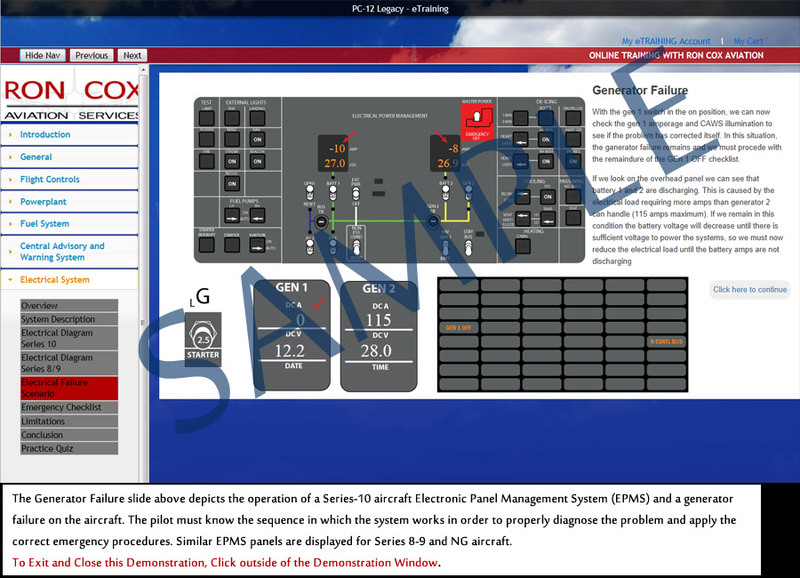 The E-Training course developed for your particular aircraft will include basic and advanced concepts on all the major sub-systems in your aircraft. Included in e-learning course will be flight and maintenance operational tips that will expand your knowledge and operational skills in flying and maintaining your aircraft. 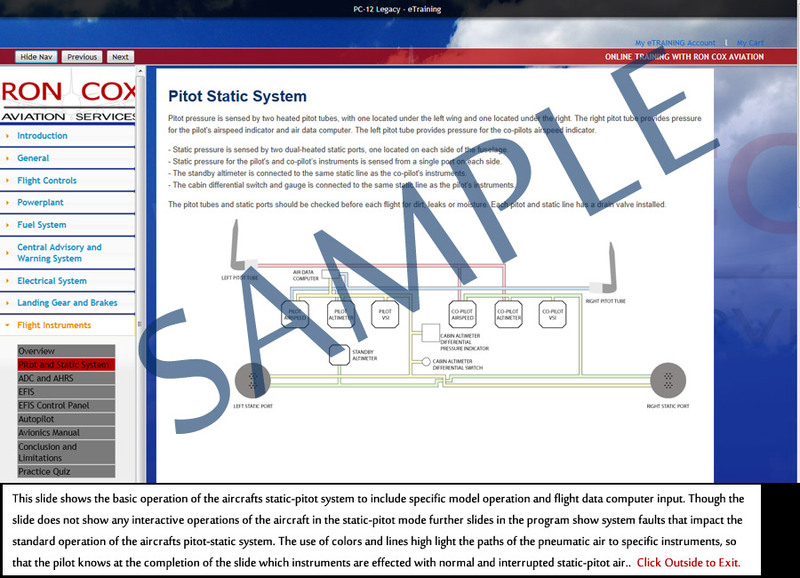 Sub modules of the e-course will have both operational limitations for the system and emergency scenarios to test your understanding of how best to operate and maintain your aircraft and piloting skills. Each chapter provides a thorough learning experience and is equipped with both a end of chapter and course examinations. Each e-learning course meets or exceeds the major aviation underwriters requirement for knowledge based learning and understanding of your aircraft systems. Each e-learning module charts and documents your learning experience during the course. Though no documentation is shared with any outside source, you’re learning experience is codified for future follow on training scenario’s be they in flight or further ground training. What are my Aircraft options? Can more than one person train at the same time? What expenses are not included in training? What is the difference between "Ground School,eTraining", and "Legacy On-site Training"? Will an instructor come to my hometown for training? * The YouTube.com Videos above are for supplemental educational purposes only. 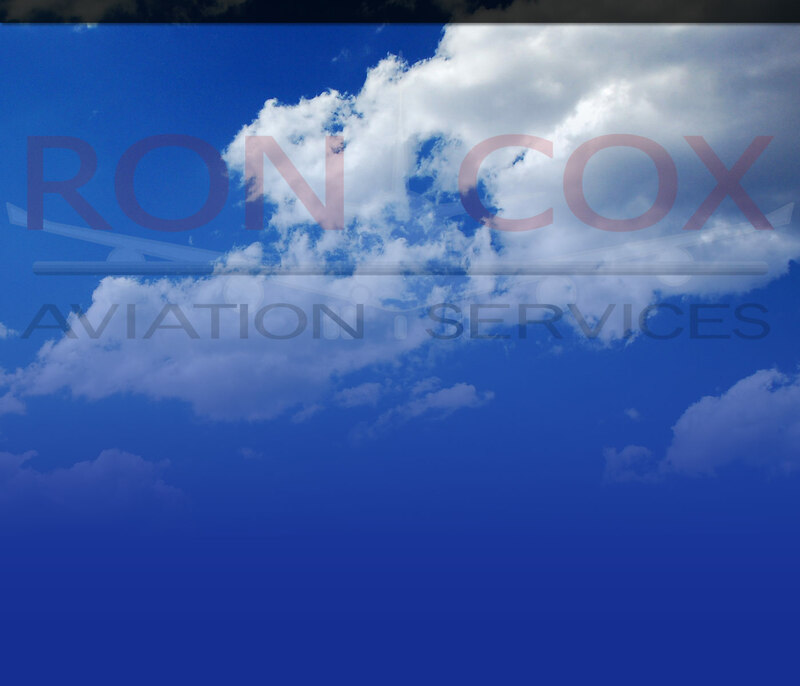 Ron Cox Aviation does not claim any copyrights to the videos.